I have had some motivation for assembling these things after the first kit (posted last week), so here is another: Damaged High Street House 03. 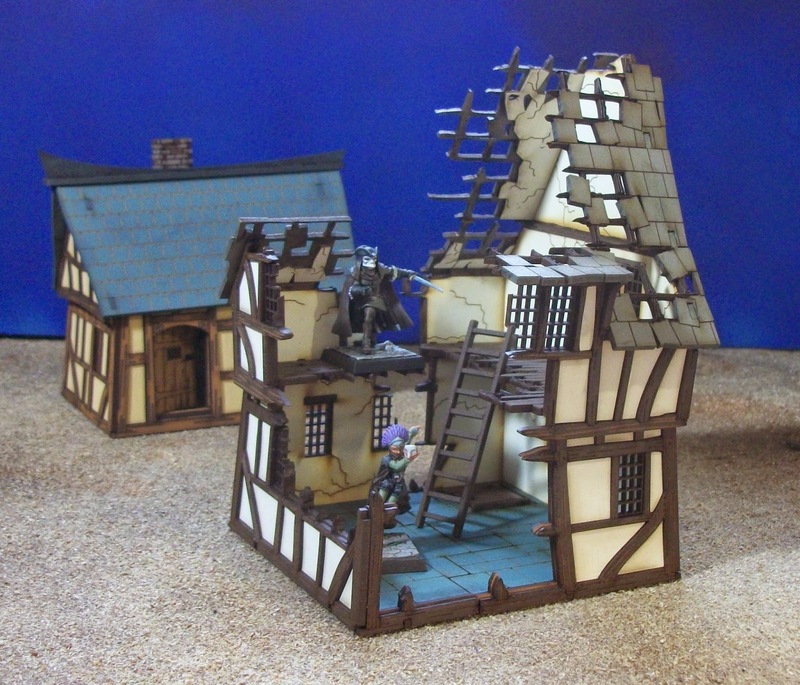 Each of the High Street Houses in the Fabled Realms range has a 'damaged' version available also. 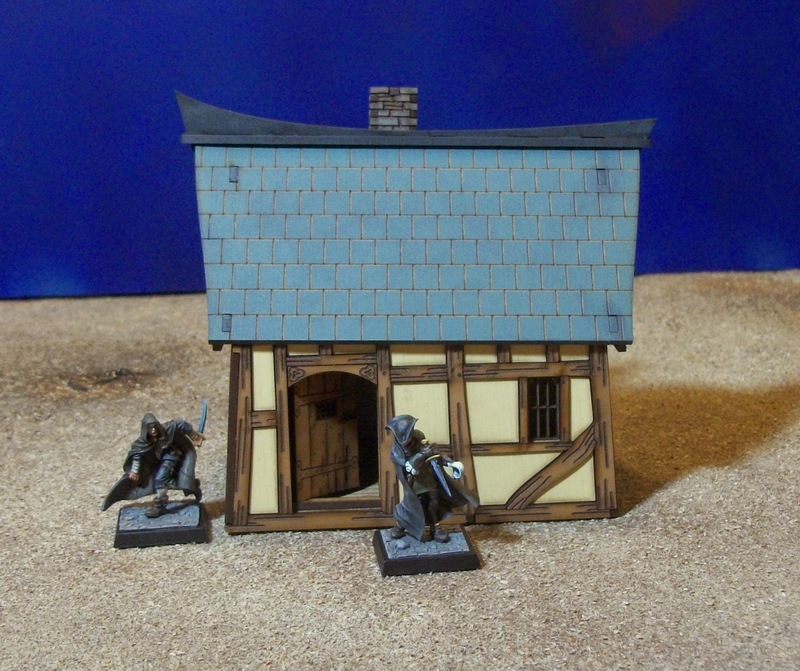 It is these that are more useful to me in gaming terms, so they will be the ones I focus on, although the smaller Backstreet Hovels are useful as small, low-rise line of sight blockers. This building costs approximately £24 GBP, and the undamaged versions sell for the same price as damaged versions. The time to build this kit was just under two and half hours. I didn't build it in one sitting, instead I worked on sub-assemblies then left the glue to cure while doing other stuff, but keeping track of time taken while I went. I am no expert hobbyist, so I reckon others could probably whip one of these out in under a couple of hours. As with the previous kit, Freebooter's Fate minis are used for scale reference. The building splits into 3 main assemblies for ease of gaming, leaving a pretty functional piece in my opinion. It has a little trap door in the ground floor, and two areas that can be left as they are or made to look like they are sunken (which I did), It also comes with a ladder. At the price point it is something I am very happy with, and definitely recommend. As I put these things together, I am learning a little about the 4Ground design process, so a couple of the initial sub-assemblies were a little misaligned, but that will help me as a proceed with the next building which is already under-way. 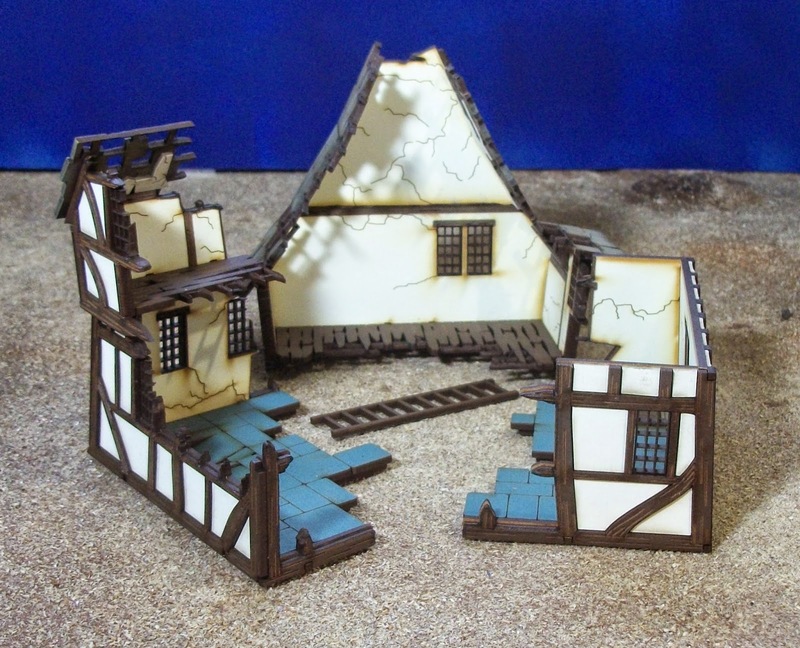 Putting together these Fabled Realms buildings has really stoked up my enthusiasm to get playing Freebooter's Fate, and so I have been scouring the rule-books and have started in on the fluff. I can't wait to get some fantasy pirate gaming in! My latest table-ready scenery piece required some building, unlike a lot of stuff I have bought more recently which has tended to be pre-painted and pre-made. However, after seeing the Fabled Realms range from 4Ground at Salute 2014, I was very interested to say the least. Rob and I had already embarked on painting our Freebooter's Fate crews, but we were a little undecided about terrain for Longfall (the primary setting for Freebooter's Fate), and both agreed that this range could be pretty much perfect for our needs. I can also see me using the buildings for Anima Tactics having seen some screenshots for the related video game. The build time was approximately 1 hour 30 minutes, although that was not continuous as I allowed assemblies to dry at various stages. I have 3 other buildings from the range, all two-storey ruins, so I expect they will take considerably longer to complete. One of my favourite things about the kit is the illusion of uneven construction created through the use of layered components. I think 4Ground have done a great job in executing the design. I am very happy with the results and when considering scratch build would take far, far more time, I am happy with the price (£16 GBP approximately) and quality. The only extra painting I did was the lugs that can be seen in the roof and the edges of the top piece to over-paint the burnt-MDF edges to disguise them a little. In all, a highly recommended kit and I will probably get at least a couple more from the range. My finalised crew for my first BMG tournament which I am playing tomorrow. It is a few years since I last played a tournament (I used to play the WH40K Grand Tournaments each year), so it will make a nice change. I have had some basic run-throughs of some of the rules, but I will be playing my first games, so I do not expect to place well at all. Play It Painted is a phrase I have seen floating around, including from the website of the same name. Play It Painted! 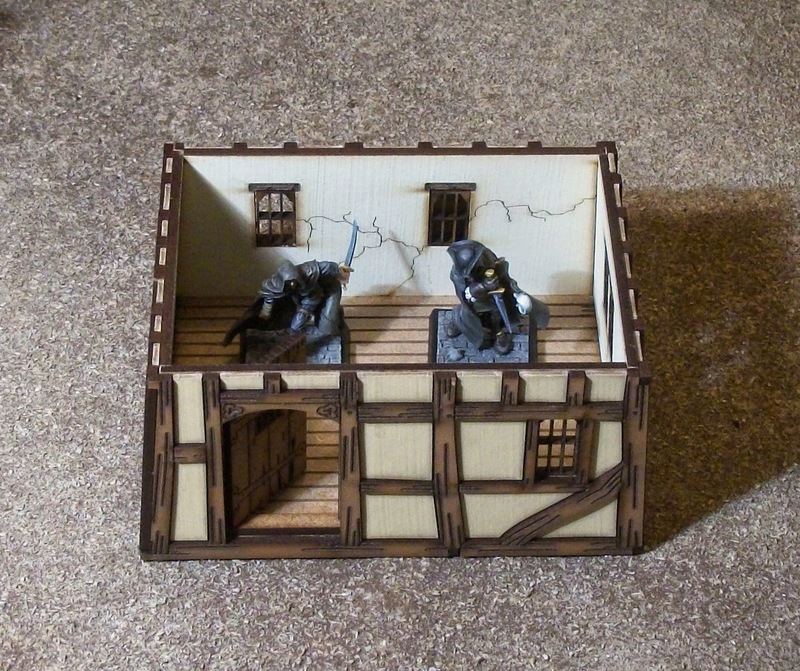 is a simple concept in miniature-related tabletop gaming- meaning miniature wargames, skirmish games, boardgames, RPG’s, or any other type of game that uses miniatures. 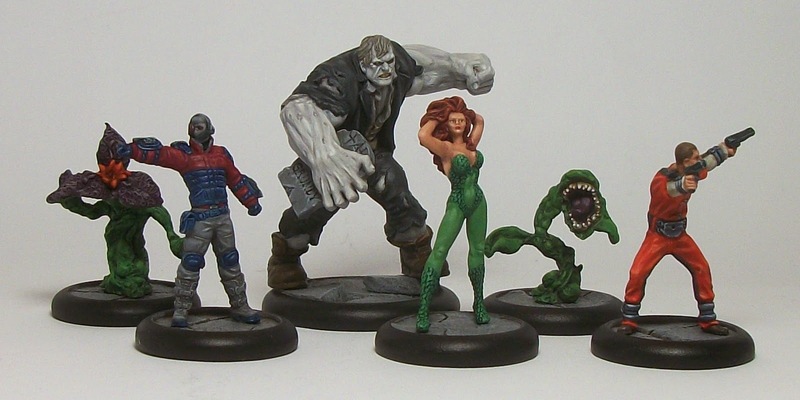 The concept is this: your gaming experience can only improve with the use of fully painted minis! In recent years it is an ethos I have taken to heart. Games just feel that much more enjoyable for me playing with and against painted minis. This thinking set my main gaming buddy Rob and me onto a course of action we call 'You paint it, I'll play it' - essentially one of us will paint at least two factions for a game that we are unlikely to both play. 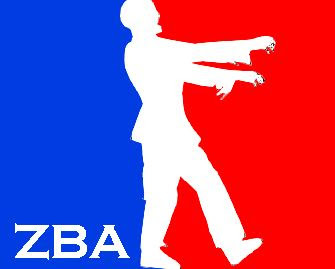 That has given us exposure to games we each may not have tried otherwise, which for me has been very cool, allowing me to try stuff like Bolt Action (re-purposed for VCBW and a better rules engine than I expected), Saga, Muskets and Tomahawks, and FUBAR for VCBW and Zombies. 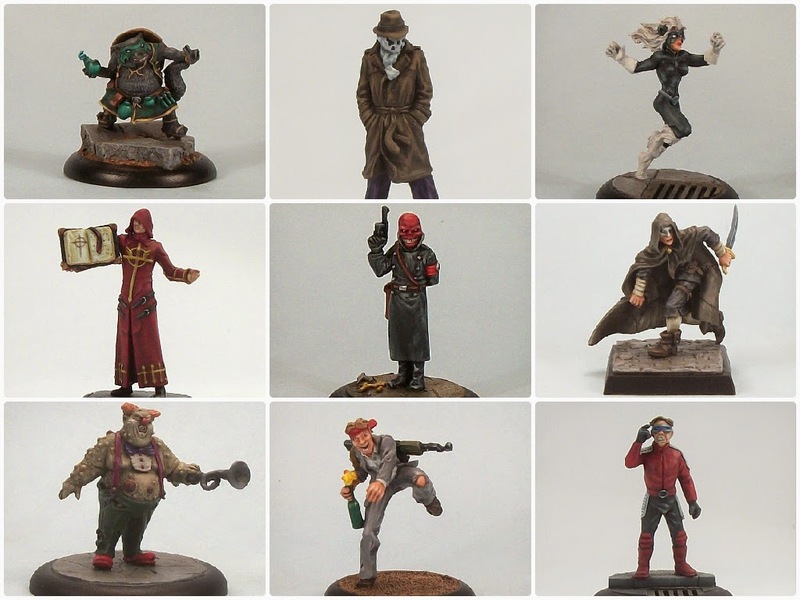 On my side there has been Anima Tactics and Pulp City (although Rob does have some Pulp City figures and will have more soon from the Kickstarter), with plans for BMG and maybe MERCS if ever get some more done for that. We also have our own forces for other games such as Freebooter's Fate, and we are both building forces for Warmachine/Hordes, so I expect some games for those eventually. The point of this ramble is to possibly explain why I am a bit of a painting and hobby gadfly - I like gaming and I prefer my skirmish gaming to involve painted minis. That likely explains the title of this particular blog as well, and means that it should remain quite 'eclectic' for years to come I hope, while providing me with lots of different opportunities for different styles of games.